"Yet you do not know what your life will be like tomorrow. You are just a vapor that appears for a little while and then vanishes away." My how the time flies! Life surely is a vapor. From James 4:14 (above), “You are just a vapor that appears for a little while and then vanishes away.” The question is, what will we do with the vapor we are given for this life? Oh, to get to the end and realize our vapor, though used up, has brought praise and glory to God. Oh, may our matchless Creator and Redeemer make it so for us all! Only He is able to take our sinful flesh, keep our eyes on the prize and upward call of Christ Jesus, and form in us a life that counts for eternity. Praise Him! We thought you might enjoy a few snippets of what we have been doing with our vapor. We are so grateful for what the Lord is doing in Sarah's life. Doing this recital was a real step of faith for Sarah, as it is definitely not her preference to perform. In our opinion, Sarah is quite gifted, but at 22 she has really only had roughly 3½ years combined of formal lessons. And only the last eight months have been with an expert teacher, Dr. John Wickelgren, a graduate of Peabody Conservatory. Also, this was not only Sarah's first solo recital ever, it was also the first time she has ever performed more than one piece of memorized work. The whole concert was done from memory, a major accomplishment in my opinion. Sarah was deeply dependent on the Lord through it all, and her love of music only increases her love for God, the true creator of sound and music! If you are interested, we hope to soon put the entire recital, in video as well as audio format, at our www.gcfamilies.org website. We will put a 'hot link' from the home page to the resources section. Sarah, as she continues to minister with us, will also be continuing to improve her piano skills, continue teaching, as well as be available to do music for weddings or other venues. Her own website, under development, is www.sbeall.com. In honor of Sarah's graduation and recital milestone, we have included a devotional she wrote recently which we found very relevant to a young person coming of age when raised with Christian values in a Christian home. If you are interested, we have a number of other devotionals Sarah has written at our www.gcfamilies.org website, under resources. 2. The World Should Know . . . America’s Christian Heritage! Bernie was invited by our dear friends with Bridges Int’l to speak twice to large groups of international students in D.C. for a national conference in December. 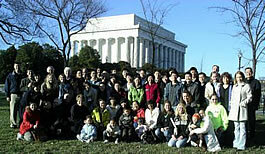 The first group was for a bus tour of the major monuments (see photo). On New Year’s Eve, he again shared stories of faith and God’s providence in the founding of our nation with another group of int’l students, as part of the evangelistic conclusion of the conference. Several placed their trust in Christ. To God be the glory! Bernie enjoyed helping set up host families for ten visiting Korean students from the Homeschool Friend program, who were visiting America for a five week English language total immersion experience. Toward the end of the visit, Bernie did a spiritual heritage tour for these students and their host families, in Washington, DC. In the past decade, Bernie has taken Josh, Aaron and Sarah to numerous TeenPact classes. We thought he had ‘retired’ from TeenPact, but decided this year to do it one more time with Daniel. It is an excellent four day leadership development and Christian government class held in many state capitals, including Maryland’s. Bernie served as the Guest Director, as Daniel blessed and challenged everyone there by sharing selected Bible chapter scripture memory passages each day. We had another fun time this year hosting a dozen couples from our church family. This year we enjoyed a fun game Bernie created, which helped spouses encourage and bless each other by looking at the “One Another” commands of the New Testament. 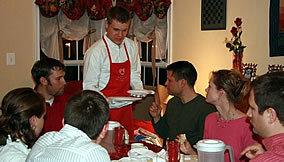 Our young adults served us again, and did a great job!